The Afghan Air Force (AAF; Pashto: دافغانستان هوائی ځواک‎; Dari: قوای هوائی افغانستان‎) is the aerial warfare branch of the Afghan Armed Forces. It is divided into four wings, with the 1st Wing at Kabul, the 2nd Wing at Kandahar, the 3rd Wing at Shindand, and the 4th Wing at Mazar-i-Sharif in northern Afghanistan. Lt. Gen. Mohammad Dawran serves as Chief of Staff of the Afghan Air Force and Major General Abdul Wahab Wardak is the Afghan Air Force Commander. The command center of the Afghan Air Force is located at Kabul International Airport and the Shindand Air Base in Herat Province serves as the main training area. The Afghan Air Force was established in 1924 under the reign of King Amanullah and significantly modernized by King Zahir Shah in the 1960s. During the 1980s, the Soviet Union built up the Afghan Air Force, first in an attempt to defeat the mujahideen and in hopes that strong Afghan airpower would preserve the pro-Soviet government of Najibullah. The Afghan Air Force had over 400 aircraft, including more than 200 Soviet-made fighter jets. The collapse of Najibullah's government in 1992 and the continuation of a civil war throughout the 1990s reduced the number of Afghan aircraft to less than a dozen. During Operation Enduring Freedom in late 2001, in which the Taliban government was ousted from power, all that remained of the Air Force was a few helicopters. Since 2007, the NATO Combined Air Power Transition Force (CAPTF), which was renamed the NATO Air Training Command-Afghanistan (NATC-A) in 2010, has worked to rebuild and modernize the Afghan Air Force. The CAPTF / NATC-A serves as the air component of the NATO Combined Security Transition Command-Afghanistan which is responsible for rebuilding the Afghan Armed Forces. The AAF currently has about 100 aircraft and around 5,000 airmen. By 2016 the NATO training mission in Afghanistan wants to raise the ranks of the AAF to 8,000 airmen and increase the number of aircraft, which are progressively getting more advanced. The Afghan Air Force began on 22 August 1924, when the Afghan Air Force was established. As early as 1921, the Soviet Union and Great Britain provided a small number of aircraft to Afghanistan's King Amanullah Khan who had been impressed with the British use of aircraft against his government in 1919, however they were not made into a separate air arm until 1924. For the next decade, Soviet pilots performed the bulk of the flying and equipping for the AAF, probably about one-half of the aircraft were Polikarpov R-1s, a Soviet copy of the de Havilland DH.9A. Most AAF aircraft were destroyed in the civil war that began in December 1928, and it was not before 1937 that a serious rebuilding effort began. From the late 1930s until World War II, British Hawker Hind and Italian IMAM Ro.37 aircraft constituted the bulk of the Afghan Air Force, which by 1938 amounted to about 30 planes in service. The Hawker Hind remained in the Afghan inventory until 1957, and as of 2009 one former Afghan Air Force Hawker Hind still flew in the Shuttleworth Collection. In 1947, the Air Force was redesignated the Royal Afghan Air Force (RAAF), a title it retained until further political upheaval in 1973. MiG-15 fighters and Il-28 bombers of the Afghan Air Force (AAF) in 1959. 90 MiG-17s – one regiment of MiG-17s and MiG-19s reported at Mazar-i-Sharif in 1990. 60 Su-7s and Su-17s – Warplane, a British partwork, reported in its issue 21, published in 1985, that some 48 Su-7BMs, without Su-7UM two-seaters, had been supplied from 1970, forming the equipment of two fighter/ground attack squadrons at Shindand Airbase. Mi-17 helicopters of the AAF during the 2010 air show in Kabul. After the Soviet withdrawal and the departure of foreign advisors, the Air Force declined in terms of operational capability. 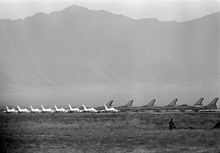 With the collapse of the Najibullah Government in 1992, the Air Force ceased to be a single entity, instead breaking up amongst the different mujahideen factions in the ongoing civil war. By the end of the 1990s, the military of the Taliban maintained five supersonic MIG-21MFs and 10 Sukhoi-22 fighter-bombers. They also held six Mil Mi-8 helicopters, five Mi-35s, five L-39Cs, six An-12s, 25 An-26s, a dozen An-24/32s, a IL-18, and a Yakovlev. The Afghan Northern Alliance/United Front operated a small number of helicopters and transports and a few other aircraft for which it depended on assistance from neighboring Tajikistan. With the breakdown of logistical systems, the cannibalization of surviving airframes was widespread. The US/Coalition operations in the fall of 2001 destroyed most of the remaining Afghan aircraft. It was 2005 before a US-led, international effort began to rebuild the Afghan Air Force; since 2007, the pace has increased significantly under the auspices of the Combined Air Power Transition Force. The Mil Mi-24 and Mi-35 (export model) attack helicopters have a long history in Afghanistan. The aircraft was operated extensively during the Soviet invasion of Afghanistan, mainly for attacking Afghan mujahideen fighters. Early in the war, the only anti-air weapons of the mujahideen were Soviet made shoulder-launched, heat-seeking SAMs and American Redeye, which had either been captured from the Soviets or their Afghan allies or were supplied from Western sources. Many of them came from stocks the Israelis had captured during their wars with Soviet client states in the Middle East. Owing to a combination of the limited capabilities of these early types of missiles, poor training and poor material condition of the missiles, they were not particularly effective. Mi-35 attack helicopter of the AAF. Beginning in 1986, the US supplied the mujahideen with its state-of-the-art heat-seeking missile, the Stinger, which the Afghans employed with devastating effect. In the first use of the Stinger in Afghanistan, mujahideen fighters downed three of eight unsuspecting Soviet Mi-24 Hinds as they approached the airfield at Jalalabad on a late September afternoon. Some scholars point to that event in 1986 as the turning point in the war. Moreover, for most of the remainder of the war when Stingers were known to be present, Soviet and Afghan aircraft elected to remain at higher altitudes where they were less vulnerable to the missile, but also less effective in ground attacks. Although employed extensively throughout the war as a ground attack platform, the Hind suffered from a weak tail boom and was found to be underpowered for some missions it was called upon to perform in the mountains of Afghanistan, where high density altitude is especially problematic for rotary-wing aircraft. Overall, the Hind proved effective and very reliable, earning the respect of both Soviet and Afghan pilots as well as ordinary Afghans throughout the country. The mujahideen nicknamed the Mi-24 the "Devil's Chariot" due to its notorious reputation. Since the end of the Soviet-Afghan war, the civil war of the 1990s, and the post-11 September 2001 US/Coalition operations, the Afghan Air Force (AAF) is again using the Mi-35 Hind. The recently opened North Kabul International Airport cantonment area includes the new headquarters for the Afghan Air Force and 201st Kabul Air Wing. The wing's three operational squadrons, one fixed-wing, one rotary-wing, and the Presidential Airlift Squadron, are housed there. The cantonment area includes state-of-the-art hangars as well as operations, logistics, billeting, dining, and recreational facilities. Additionally, extensive AAF facilities are in-progress at Kandahar International Airport. A number of Afghan pilots and pilot-candidates traveled to the United States beginning in May 2009 for English language training, to be followed by instrument training for the pilots and undergraduate pilot training for the pilot-candidates. This was the start of an initiative that within the next several years should produce a small cadre of seasoned, instrument-rated Afghan Air Force pilots as well as a larger number of younger, well-trained pilots who will serve as the backbone of the Afghan Air Force for the next generation. Other NATC-A-led programs include English language and technical courses for AAF personnel in various specialties including aircraft maintenance, logistics, communications, and engineering. As of June 2009, the Air Force numbered about 2,400 airmen, with a planned strength of 7,400 airmen within several years. In late 2009, the AAF began receiving refurbished former Italian Air Force C-27A tactical transports and Mi-17V5 Hip transport helicopters. In June 2010 the Afghan National Army Air Corps became a separate and independent service and was renamed the Afghan Air Force by order of Afghan President Hamid Karzai. Also in the same year, a number of female trainers completed their courses and were commissioned as lieutenants. Many more are being trained as the number of the AAF increases. As of March 2011, the Afghan Air Force (AAF) had 44 rotary-wing and 13 fixed-wing aircraft in serviceable condition. By the end of 2011, the AAF had 16 C-27As (on loan from the U.S government) and 35 of the new Mi-8 Hips while continuing to operate the older Mi-17s and retiring the An-32 fleet. Further growth of the AAF may depend on decisions yet to be made regarding the size of the Afghan National Army which, in turn, will determine AAF requirements. In a country of rugged terrain possessing limited ground transportation options, the Afghan Armed Forces depends heavily upon AAF fixed- and rotary-wing aircraft for airlift of soldiers and supplies between corps operating locations, medical and casualty evacuation, and transport of human remains. The Afghan government also relied on the AAF for transportation of election materials during the 2009 presidential election. It was announced in October 2011 that the Afghan Air Force would be provided with 145 multi-type aircraft and 21 helicopters. By the end of 2011, the Afghan Air Force had a total of 4,900 airmen and personnel. As of November 2017, the Afghan Air Force has about 217 aircraft and approximately 6,800 personnel. There are four Afghan Air Force wings, one each in Kabul (1st Wing), Kandahar (2nd Wing), Shindand (3rd Wing), and Mazar-i-Sharif (4th Wing). Abdul Raziq Sherzai serves as a major general and commander of the Kandahar Air Wing. In 2017 the decision was made to transition from Russian to US helicopters due to issues with sourcing parts and maintenance because of ongoing diplomatic issues between the US, the AAF main source of funds, and Russia. Consequently, it has been decided to transition the AAF Mi-17s to refurbished UH-60 Black Hawk helicopters. The US Department of Defense (DoD) have requested $814.5M for 2017 for the first year of our plan to re-equip the Afghan Air Force and to provide funding to procure 53 UH-60s, with refurbishment and modification of the first 18. Long term the US plan to provide 159 UH-60 Black Hawks with funding for the first 53 already being secured in the 2017 budget. The DoD will have to request additional funds each year to procure the rest of the proposed aircraft. Deliveries are expected to start in 2019 with 30 helicopters expected to be delivered each year. The UH-60s are also to be fitted with rocket pods to increase their offensive capability and the first four UH-60s slated for training are expected to arrive in Afghanistan in autumn 2017. The refurbished helicopters will be 1980s UH-60As with new engines with the most likely choice being the General Electric T-700-GE-701C, which is found on the U.S. Army's newer UH-60Ls and Ms, as well as the up-coming UH-60V model. The DoD also want to procure 30 additional armed MD-530F helicopters and 6 additional A-29 attack aircraft to replace the Mil Mi-35 in service with the AAF. They have also asked for funds to add an additional five AC-208s to the fleet. The requested FY2017 Afghan Security Forces Fund (ASFF) budget, including the 23 additional funds for the first year of this proposed aviation initiative, went to Congress on 10 Nov 2016. By 2016 the Afghan Air Force is to expand to 8,000 airmen and will operate 145 aircraft. To that end there has been continuing expansion in infrastructure, training and maintenance facilities. The US has also been purchasing modern equipment and aircraft including Russian Mi-17 helicopters. Significant investment has also gone into purchasing modern training aircraft such as MD 500 helicopters and fixed-wing Cessna 182 and 208 planes. In 2013 Afghanistan sent India a large wish-list of equipment which included one An-32 and two Squadrons of Mi-17 and Mi-35 helicopters. This deal was initially put on hold due to fears of antagonizing India's regional rival Pakistan, but in 2014 India reached a compromise where instead of directly supplying the equipment it would instead pay Russia to deliver them instead. This deal includes arms, ammo and the refurbishment of weapon systems and aircraft left behind by the Soviets. India further agreed to help refurbish older Soviet-era aircraft in Afghan Air Force. As a part of this two Indian Air Force teams visited Afghanistan and identified around 50 aircraft which can be serviced and brought back to active service in Afghanistan. This included Mi-25/35, Mi-8 and An-32s aircraft. Currently the US is looking to finalize the re-tendering process for 20 attack aircraft that can also be used for training and to provide the Army with close air support. The two contenders were the Embraer A-29 Super Tucano and the Beechcraft AT-6. Embraer won the previous contract but the tendering process was cancelled after it was discovered that proper procedures were not followed. A winner for the new contract was expected in June 2013 with first deliveries expected to begin in the third quarter of 2014, about 15 months after originally planned. The Super Tucano was declared the winner of the contract again in 2013. The contract will be completed by Sierra Nevada Corp. for 20 A-29 Super Tucanos with an expected delivery date of between December 2015 and 2018. According to the Wall Street Journal, the first 10 will be stationed at Shindand Air Base, in western Afghanistan. The other 10 are to go to Kandahar Airfield. On 18 December, the first A-29 Super Tucano pilots of the 81st Fighter Squadron graduated at Moody Air Force Base, Georgia, USAF Col. John Nichols, the 14th Flying Training Wing Commander said of the pilots, "The extraordinary dedication of these pilots and the sacrifices these graduates have made will help establish a secure, stable and unified country,". "They are enabling the future of Afghanistan, a future that will be decided by the Afghans themselves." The pilot graduates and the remaining 22 student pilots will receive further, advisory support in Afghanistan. The first four aircraft arrived in Afghanistan in January 2016, with a further four due before the end of 2016. Combat ready Afghan A-29 pilots graduated from training at Moody Air Force Base returned to Afghanistan to represent the first of a total of 30 pilots trained by the 81st Fighter Squadron at Moody. A total of 20 A-29's will be in place by 2018, according to a senior U.S. defense official. The Pentagon purchased the Super Tucanos in a $427 million contract with Sierra Nevada Corp. and Embraer, with the aircraft produced at Embraer's facility in Jacksonville, Florida. Pilot training is undertaken by the U.S. Air Force's 81st Fighter Squadron at Moody Air Force Base, Georgia. The Afghan Air Force's new fixed-wing Embraer/Sierra Nevada A-29 Super Tucano could soon make its combat debut after the first four aircraft arrived at Hamid Karzai International Airport on 15 January 2016. The U.S. Navy equipped the Afghan Air Force with refurbished An-32 transport aircraft during initial reconstruction efforts. These aircraft augmented an existing fleet of An-32 and AN-26 aircraft. The An-32 was retired on 17 June 2011 in a push to move operations over to the C27 program but like the L-39, it is still kept in ready status by the Afghan Air Force. The United States purchased the C-27A, to move away from Soviet era aircraft. A total of 20 former Italian military C-27As were purchased with the intent of providing the Afghan Air Force a fleet that would last 10 years. However, the prime contractor in the refurbishment and supply of the planes, Alenia Aermacchi North America, a unit of Italian defense conglomerate Finmeccanica S.p.A., was unable to provide adequate maintenance support for the aircraft. As a result, the majority of the fleet at any time was grounded for safety of flight issues (including a period where the entire fleet was grounded for over 6 months). The US military worked over the course of three years with Alenia North America to get the fleet fully operational. Part of the issues with supplying the C-27As came about from ownership. The C-27A program included an initial parts supply and training contract for the Afghan Air Force. Upon arrival of the first two aircraft in November 2009, Brig. Gen. Michael R. Boera, commanding general, Combined Air Power Transition Force and commander of the 438th Air Expeditionary Wing announced that the aircraft were part of the Afghan National Army Air Corps in a ceremony at Kabul International Airport. The contract for the aircraft, a 14-month effort, had the U.S. government as the end user of the aircraft due to an Italian arms embargo with Afghanistan. The U.S. declaration that the C-27A was now an Afghan Air Force asset effectively violated international law and the Italian government enforced the embargo and stopped shipment of contracted supplies to Afghanistan. This put the U.S. government in a dilemma since the $290 million contract was funded through the Afghanistan Security Forces Fund (ASFF) which required, by U.S. law, that all military materials purchased be turned over to the Afghan government. The C-27A was eventually determined to be a U.S. owned asset utilized by the Afghan Air Force with intent to turn over the asset in the future (assuming the Italian embargo would at some point be lifted or that enough supplies could be stock piled to take the aircraft through its expected 10-year service life), but this determination was not immediate. This caused a delay of contracted goods beyond the time frame of the initial contract through no fault of the contractor, and made it necessary for the U.S. government to enter into a second more costly maintenance contract with Alenia North America to get aircraft operational. Since the C-27A aircraft purchased still had Italian military air worthiness certificates controlled by the company, Alenia North America effectively monopolized the entire supply chain making fair competition non-existent. This second contract inflated the total program cost to over $600 million, and it would have cost over $1.2 billion had the U.S. opted to extend the contract up to 10 years. The C-27A contract with Alenia North America was eventually terminated, citing that the contractor failed to meet their legal obligations and announced that the Afghan Air Force would be receiving four C-130 transport aircraft (expected in 2013). The G-222 program legacy to the C-130 is that the cockpit and cargo compartment configurations of the C-27A are similar to that of a C-130H. The C-27A simulator program, contracted to Fidelity Technologies Corporation, produced three C-27A simulators: one Fuselage Load Trainer (cargo compartment), one Flight Training Device (cockpit), and one Basic Aircraft Training Device (cockpit). These training devices were built to FAA standards from two derelict U.S. Air Force C-27A aircraft and allowed the Afghan Air Force to continue to train while the C-27A fleet was effectively out of service for over a year, making transition to the C-130 a feasible alternative. A Mi-17 from the Afghan Air Force takes off from Kabul International Airport. The total number of Mi-17 helicopters currently in service with the Afghan Air Force is unclear. The US has purchased a number of new Mi-17s for the AAF from Russia and from other nations such as the Czech Republic and Slovakia. There were also some existing Mi-17s in the country before the invasion and subsequent formation of the Air Force. It has also been reported that at least 2 Mi-17s have crashed. The most recent acquisition of Mi-17s is for 21 airframes, spare parts and training. These all include western avionics. Eighteen of these have been delivered in 2012. As part of the contract, there was also an option for another twelve Mi-17s, raising the contract to 33. They were modified in the UAE after being delivered to the US Army to fit Afghan Air Force requirements better before being sent to Afghanistan. The Afghan Air Force has two Mi-17v5 Flight Training Devices, one Mi-17v5 Basic Aircraft Training Device, and one Mi-17 Cockpit Procedure Trainer built by Fidelity Technologies Corporation. The Air Force was expected be in possession of 46 Mi-17 helicopters by June 2012, with an additional 10 to be delivered by 2016. Royal Air Force Flight Lieutenant Luke Meldon explains the components of an AAF C-27 Spartan to Thunder Lab students. Training is undertaken at the Shindand Air Wing at Shindand Air Base in western Afghanistan. The base which has been refurbished and expanded by NATO which tripled its size. The seven candidates are all graduates of the National Military Academy of Afghanistan or Initial Officer Training held in the United Kingdom and have also undertaken English language training in the Kabul English Language Training Center. Students will be trained in both fixed-wing aircraft, namely the Cessna 182T and 208B and in rotary wing aircraft, the MD 530F. About 6 MD 530F helicopters were delivered to Shindand in late 2011. The initial 6 helicopters have completed acceptance flights and can now be used to begin training Afghan Pilots, although one was destroyed in 2013 by an IED. The four-year contract could see as many as 54 other helicopters being supplied to the AAF. With the delivery of 20 Advanced fixed-wing light support aircraft, the A-29 Super Tucano Afghan pilots will have to undergo further training. This will significantly increase the level of knowledge and experience in the air force. The Afghan Air Force (AAF) deteriorated following the collapse of Najibullah's government in 1992, and it was nearly eliminated by US/Coalition air strikes during Operation Enduring Freedom in late 2001. The new NATO-assembled Afghan Air Force has been gradually increasing its aircraft inventory, personnel, and operational capabilities since at least 2007. The last addition of aircraft was made in December 2011, which included 12 trainers and 6 helicopters from the United States. Hamid Karzai International Airport Built by the Soviets in 1960, is a dual-use airport, civilian and military, the primary hub for international civilian flights. It serves as the home of the AAF 1st Wing and includes state-of-the-art hangar facilities, as well as operations, logistics, billeting, dining, and recreational facilities. It is also used by the USAF. Kandahar International Airport Built by the US around 1960, it is also a dual-use airport serving civilian traffic to Kandahar and military support for the southern and central portions of the country. It is the home of AAF 2nd Wing. Kandahar has been a major center for American and Canadian forces and in mid-2009 underwent a major build-up of US/Coalition forces. Shindand Air Base Built by the Soviets in 1961. Home to the AAF 3rd Wing, is the second largest military air base in the country, located just south of Herat with significant military aircraft shelters and facilities. Its location made it a prime candidate as a training base for the AAF. Herat International Airport Built by the US in the 1950s, it is the primary civil airport for the western portion of the country, but also houses military aircraft. Camp Marmal Built by the Bundeswehr in 2005-2006, it is a dual-use airport serving the northern and central portions of the country. A small American contingent has been based there. Bagram Airfield Built by the US in the 1950s, Bagram is the largest all military air base in Afghanistan. It is currently a primary center for United States and allied forces for cargo, helicopter, and support flights. It has a 3,000-meter runway capable of handling heavy bombers and cargo aircraft. During its first incarnation, Afghan aircraft carried simple black and white depictions of the Arms of Afghanistan, with the inscription 'God is great' on the underside of the wings. The Afghan flag was possibly used as well. Afghanistan adopted a black, red, and green flag after the 1929 revolt, and when the Air Force was given aircraft again in 1937, it placed this flag on the rudder, and adopted wing and fuselage roundels based on the three colors. Roundel introduced in 1967; also used as a fin flash. The three letters are the initials of Afghan Nero-e-Hawa (Afghan air force). Another variant of the roundel introduced in 1967; also used as a fin flash. Variants of this emblem adorned many Afghan military aircraft in 2006. The three letters are the initials of Afghan Ordou-e Melli (Afghan National Army). The Royal Afghan Air Force retained the roundels until adopting a new style in 1967, with a unique insignia consisting of a tri-color triangle using the national colors upon a white disc, on which was inscribed with Arabic lettering forming various phrases. This roundel was placed on the rudder in place of the flag. This remained in use after the overthrow of the monarchy until the Russian invasion in 1979, when a new insignia of a red disc with yellow inscriptions was adopted. This was short-lived however, as in 1983, a more Soviet-standard red star on a white disc ringed in black, red, and green was adopted. These were maintained until after the Soviet departure. Upon the departure of Soviet forces from Afghanistan, and the fall of the communist government, a return to the triangle insignia was noted, although markings varied depending on the ownership of the aircraft. ^ Pike, John. "Afghan Air Force (AAF)". www.globalsecurity.org. Archived from the original on 12 January 2018. Retrieved 11 January 2018. ^ Pike, John. "Afghan Air Force (AAF) - Modernization". www.globalsecurity.org. Archived from the original on 12 January 2018. Retrieved 11 January 2018. ^ "The New Afghanistan Air Force". Archived from the original on 24 November 2018. Retrieved 11 January 2018. ^ a b "Afghanistan receives another C-130 aircraft from US". khaama Press. 24 September 2014. Archived from the original on 25 September 2014. Retrieved 30 September 2014. ^ a b "World Air Forces 2017". Flightglobal Insight. 2017. Archived from the original on 29 July 2017. Retrieved 17 January 2017. ^ "Virginia National Guard's 29th Infantry Division mentors making a diff". Archived from the original on 15 January 2018. Retrieved 14 January 2018. ^ a b c "U.S. Builds Afghan Air Base, but Where Are the Planes?". The Wall Street Journal. 24 July 2012. Archived from the original on 12 November 2017. Retrieved 3 August 2017. ^ Diamond, Mark (22 July 2009). "Senior Afghan commander's visit supports AMC role in building partnerships". United States Air Force. Archived from the original on 11 February 2011. Retrieved 4 December 2009. ^ "U.S. Air Forces Central Command". Archived from the original on 28 May 2014. Retrieved 24 March 2015. ^ Martin Kuz. "Sprawling air base in western Afghanistan reflects hopes, perils of massive buildup – News". Stripes. Archived from the original on 19 June 2012. Retrieved 28 April 2012. ^ Lennart Andersson. "The First Thirty Years of Aviation in Afghanistan, part 1". z-bok.se. Archived from the original on 24 October 2009. ^ Tom Cooper (29 October 2003). "Afghanistan, 1979-2001; Part 1". Air Combat Information Group. Archived from the original on 16 July 2012. ^ a b John Pike. "The Air War In Afghanistan". Archived from the original on 15 March 2017. Retrieved 24 March 2015. ^ Urban, Mark (1988). War in Afghanistan. Houndmills, Basingstoke, Hampshire: MacMillian Press. pp. 225–226. ISBN 978-0-333-43263-1. ^ York, Geoffrey. The Globe and Mail, "Military Targets Are Elusive. Afghanistan Army Called a Haphazard Operation", 19 September 2001. ^ Debay, "Wings over Panjshir"
^ Yakubovich, Nikolay. Boevye vertolety Rossii. Ot "Omegi" do "Alligatora" (Russia's combat helicopters. From Omega to Alligator). Moscow, Yuza & Eksmo, 2010, ISBN 978-5-699-41797-1, pp.164–173. ^ "US-funded Afghan C-27s scrapped for 6 cents per pound". Archived from the original on 29 December 2016. Retrieved 8 June 2017. ^ "The Frontier Post". The Frontier Post. Archived from the original on 21 April 2012. Retrieved 28 April 2012. ^ "World Air Forces 2016 pg. 11". Flightglobal Insight. 2015. Archived from the original on 19 January 2016. Retrieved 28 March 2016. ^ "DVIDS – News – Admiral Handley visits Task Force Stethem in Kandahar". DVIDS. Archived from the original on 7 April 2015. Retrieved 24 March 2015. ^ a b "US approves $76.7 million contract in support of Afghan Air Force". Khaama Press. 26 May 2017. Archived from the original on 27 May 2017. Retrieved 28 May 2017. ^ Snow, Shawn; Wolf, Mackenzie (17 May 2017). "US to provide Afghanistan with up to 159 Black Hawks to help break 'stalemate'". US Military. Archived from the original on 24 May 2017. Retrieved 28 May 2017. ^ Trevithick, Joseph (18 May 2017). "The US Plan to Give Afghanistan a Fleet of Black Hawks Is Deeply Flawed". The Drive. Archived from the original on 26 May 2017. Retrieved 28 May 2017. ^ "Afghan air force learns to fly — and fix aircraft - Boston.com". Articles.boston.com. 18 January 2012. Archived from the original on 8 July 2012. Retrieved 28 April 2012. ^ "Afghanistan sends India a weapons wish-list ahead of NATO withdrawal". Mail Online. Archived from the original on 24 September 2015. Retrieved 24 March 2015. ^ "India turns to Russia to help supply arms to Afghan forces". Reuters. Archived from the original on 29 March 2015. Retrieved 24 March 2015. ^ "India to pay Russia for arms, ammo it sells to Afghanistan". The Indian Express. 18 April 2014. Archived from the original on 2 March 2015. Retrieved 24 March 2015. ^ "India to restore grounded aircraft in Afghanistan". Archived from the original on 28 November 2016. Retrieved 29 November 2016. ^ Shalal, Andrea (4 May 2012). "US Air Force seeks 2014 delivery of Afghan planes". Reuters. Archived from the original on 13 May 2012. Retrieved 12 May 2012. ^ Reed Business Information Limited. "Super Tucano beats out AT-6 for Afghan Light Air Support tender". Archived from the original on 1 October 2015. Retrieved 24 March 2015. ^ Air Forces Monthly. Stamford, Lincolnshire, England: Key Publishing Ltd. April 2013. p. 28. ^ Gady, Franz-Stefan (12 March 2015). "When Will the Afghan Air Force Be Ready to Fight the Taliban?". The Diplomat. Archived from the original on 13 October 2015. Retrieved 29 September 2015. ^ Hodge, Nathan (28 December 2011). "Hawker Beechcraft Sues Over Air Force Bidding - WSJ.com". Online.wsj.com. Archived from the original on 15 March 2019. Retrieved 28 April 2012. ^ Tinsley, Ceaira (21 December 2015). "First A-29 Afghan pilots graduate, ready for combat". USAF. Archived from the original on 11 January 2016. Retrieved 30 December 2015. ^ "Afghan air force awaits arrival of first fixed-wing attack aircraft". Military Times. 21 December 2015. Archived from the original on 16 January 2016. Retrieved 27 February 2016. ^ "First of 20 A-29 Super Tucanos arrive in Afghanistan". 19 January 2016. Archived from the original on 3 July 2017. Retrieved 27 February 2016. ^ NAVAIR Headquarters, NAVAIR News Release (20 August 2008). "NAVAIR acquired Afghan An-32 aircraft support combat operations in Kandahar". Naval Air Systems Command. Archived from the original on 29 June 2013. Retrieved 28 June 2013. ^ Potapenko, Vladimir (24 June 2011). "AAF retires An-32 transport aircraft, makes way for future". U.S. Air Forces Central Command. Archived from the original on 29 June 2013. ^ Hodge, Nathan (25 May 2012). "Maintenance Snafu Grounds Afghan Fleet". The Wall Street Journal. Archived from the original on 12 November 2017. Retrieved 3 August 2017. ^ "MAJOR GENERAL MICHAEL R. BOERA". Archived from the original on 28 March 2015. Retrieved 24 March 2015. ^ Boera, Michael (16 November 2009). "C-27s to provide Afghanistan modern airlift capability". Army.mil. Archived from the original on 7 October 2013. Retrieved 27 June 2013. ^ McFarland, Ed (1 February 2013). "Afghanistan Security Forces Fund (ASFF)—The Past, Present, and Future". The DISAM Journal. Archived from the original on 6 October 2013. ^ Osborne, Anthony (4 January 2013). "U.S. Air Force Halts Troubled Afghan Air Force Transport Deal". Aerospace Daily & Defense Report. ^ Druzin, Heath (28 December 2012). "US scraps entire fleet of Afghan cargo planes". Stars and Stripes. Archived from the original on 30 June 2013. Retrieved 27 June 2013. ^ a b "Fidelity Completes Factory Acceptance Test of C-27A Fuselage Load Trainer (FLT) for US Army/Afghan National Army Air Corps". Fidelity Technologies Corporation (Press release). 3 October 2012. Archived from the original on 18 January 2015. Retrieved 28 June 2013. ^ "U.S. buying more helicopters from firm supplying Syria". Chicago Tribune. 13 June 2012. Archived from the original on 3 April 2015. Retrieved 16 June 2012. ^ a b Capaccio, Tony; Lerman, David (9 May 2012). "Pentagon Defends Buying From Russia Trader Aiding Assad". Bloomberg. Archived from the original on 31 December 2014. Retrieved 5 March 2017. ^ a b "Category". Herald Sun. Archived from the original on 13 June 2012. Retrieved 23 November 2018. ^ "DVIDS – News – Afghan pilot candidates make history … head to pilot training". Dvidshub.net. Archived from the original on 3 February 2012. Retrieved 28 April 2012. ^ Gareth Jennings. "Afghan Little Bird helo destroyed by IED Archived 29 July 2014 at the Wayback Machine" Jane's Defence Weekly, 26 September 2013. Retrieved: 13 October 2013. ^ Navy Petty Officer 1st Class Chris Fahey (15 January 2012). "New airframe adds strike capability to Afghan air force". Af.mil. Archived from the original on 19 January 2012. Retrieved 28 April 2012. ^ US delivers 18 aircraft to Afghan Air Force Archived 3 April 2015 at the Wayback Machine by Ahmad Quraishion for Pajhwok Afghan News. 10 December 2011. ^ "Afghanistan launch customer for AC-208". Air Forces Monthly. Key Publishing: 29. March 2018. ^ "Afghan air force adds six more Super Tucanos to fleet". flightglobal.com. Archived from the original on 26 October 2017. Retrieved 26 October 2017. ^ a b c d e f g h "World Air Forces 2018". Flightglobal Insight. 2018. Archived from the original on 2 December 2017. Retrieved 4 December 2017. ^ "Afghan AF acquires 3 Boeing 727s". Air Forces Monthly. Key Publishing: 30. December 2014. ^ Hodernfield, Trudy. "The Afghanistan Special Mission Wing". www.armyaviationmagazine.com. Archived from the original on 28 May 2017. Retrieved 8 June 2017. ^ "Afghanistan receives additional Blackhawks". Air Forces Monthly. Key Publishing: 28. March 2018. Wikimedia Commons has media related to Afghan Air Force.